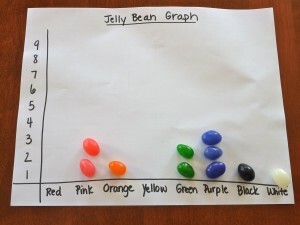 I may as well call this “Jelly Bean Math Week” because there are so many ways to use this seasonal item to build a wide variety of math skills. (I’m sure they are around all year, I just associate them with this time of year.) Grab some jelly beans (and a toothbrush) because here I go! 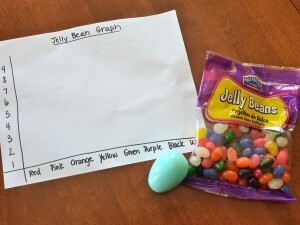 A simple sheet of white printer paper, a marker, a package of jelly beans and a plastic egg are all you need to make a jelly bean graphing station for your child’s My Obstacle Course. Jelly beans contained in plastic egg until it's time for the activity. 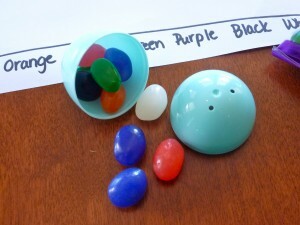 For this station activity, make your graph sheet and place some jelly beans inside the plastic egg. You can choose specific amounts or just pour some in to see what you get. I frequently choose some colors to have the same amounts to work on the concept of “equal” as well as having certain colors be empty for the concept of “Zero.” It is up to you but after doing this sort of thing for a while, you may find yourself becoming more strategic with things like this to use as teaching opportunities. At the station, your child will open the plastic egg, pour out the jelly beans and sort them into the correct columns by color. When all of the jelly beans have been sorted, talk about what they notice. Click here for a PDF file containing question cards for the jelly beans. As in the other graphing posts I’ve done, I like to cut apart the questions so he can select the question. (Here is a link to print out questions: jellybeanquestions) That said, he is working on writing answers to questions in school so I may modify them a bit so there is room for him to write his answer. This simple activity paired with some question cards allows you to work on analyzing data. The bag of jelly beans provides enough jelly beans for more of the same or can be used with other activities. Stay tuned because there are more to come!